Families and fans from half a dozen states converged in Brattleboro recently for the Brattleboro Museum and Art Center’s Fifth Annual Domino Toppling Extravaganza. 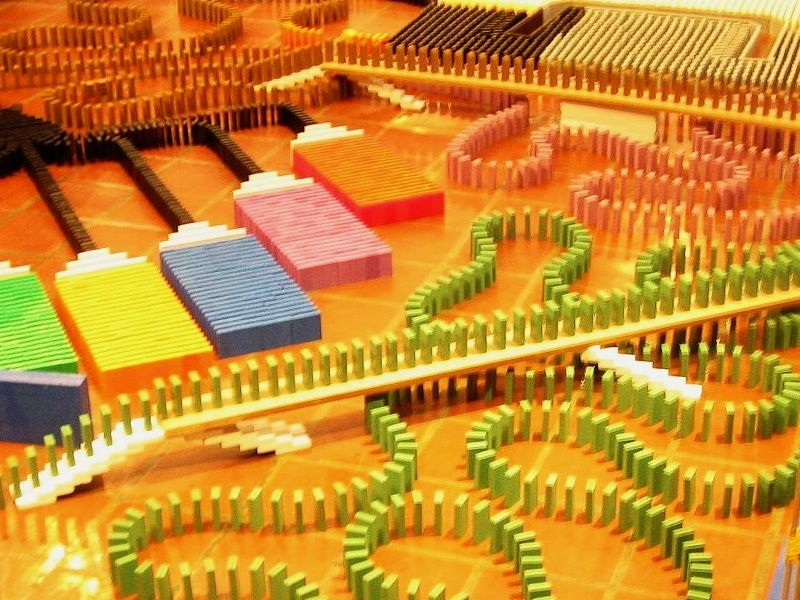 Domino topplers create elaborate designs using thousands, sometimes millions of dominoes. Then they knock them down. The popularity of this once-obscure hobby has grown with the advent of on-line videos that allow topplers to share their achievements. (Keese) The day before the big event, the Brattleboro museum is hushed, except for the clack of dominos on the red tile floor. Mike Perrucci and Shane O’Brien are on their on hands and knees, setting up a course of patterns, runs and contraptions made almost entirely of dominoes. The museum was once a train station and the old marble-bedecked passenger waiting area is now the main exhibit space. The emerging domino tableau – 40 feet long and seven and a half feet wide – takes up most of the floor. (Mike Perrucci) "We start off with a giant structure made out of K’NEX, the plastic building toy, then the big green trail that goes over and under, and then Shane’s giant 3-D brown cube." (Keese) Thirty-four year old Mike Perrucci of Perkasie, Pennsylvania, has been toppling dominoes since the 1980’s with his brother Steve, who couldn’t make it this year. He consults a sheet of graph paper where he’s plotted a mosaic of a pink monster on a black background. (Perrucci) "Let’s see, three pinks, six blacks and four violets…." (Keese) If all goes well, it will fall as a widening wave, setting off lines of blue dominoes in a carefully choreographed sequence. (Perucci) "I think it’s the many different ways that dominoes fall. You can put them in a wall, you can crash a pendulum through it, you can make a wall of many layers and have it collapse down like an avalanche…"
(Keese) The challenge is to keep the chain reaction from starting before the crowds arrive and the cameras roll. (Shane O’Brien) "One domino can set it all off." (Keese) Fifteen-year-old Shane O’Brien of New York is a rising domino star. The online videos he’s made of his basement experiments have been viewed nearly eight million times. O’Brien says the setup for this event will take at least 20 hours. (Shane) "It starts out pretty calm and then as it progresses there’s more things that could be accidentally knocked over. I’m pretty sure that when all the people are crowding around pointing out everything, I’m going to be pretty nervous." (Keese) O’Brien was 11 when he got a kit of toppling dominoes as a gift. When he started recording his basement experiments with his dad’s video camera and posted the results online. He realized there were other topplers out there, sharing their work in the same way. He studied the Perrucci brothers’ videos and last year joined them for the Brattleboro event. He made a domino Mona Lisa for the 2011 toppling. Perrucci was impressed. (Perrucci) "And now he’s back, ha, ha…"
(Keese) Before the museum’s doors open, O’Brien surveys the course of images and structures connected by snaking domino lines designed to keep the action going. He’s especially proud of the 4,000-piece Brattleboro Museum logo, and the Pikachu — a Pokemon cartoon character. (O’Brien) "Everybody’s going to see the Pikachu when they first come in." (Keese) They file in by the hundreds: adults, kids, boots, coats, cameras. Some perch on the museum’s marble stairs, but most settle for the floor. They crowd the perimeter, leaning in close against the ropes guarding the display. Finally, Danny Lichtenfeld, the museum director, starts the count-down. (Lichtenfeld) "Five four, three two one…"
(Keese) A lever sends a ball tumbling down a plastic tower into a chute. (Keese) It hits the first domino, then a bridge made of popsicle sticks that flip up one by one, then the Pokemon character and the pink monster. (Keese) Something triggers a ball hanging over a big yellow smiley face. It drops, and the yellow dominoes fall outwards in a perfect circle. An even bigger ball sets the finale in motion, triggering a wooden catapult that flings up a bucket of confetti. (Keese) When it’s over the kids rush in to help with the cleanup. Shane O’Brien says it went almost perfectly. Out of 19,928 dominoes, he says only 20 failed to topple. He counts that a good day.